Received in 1957 from the Hermitage, Leningrad. The 1950s saw the revival of the Chinese porcelain-making industry which had declined towards the end of the 19th century. In Chintechen, the traditional centre of the craft, a research centre was opened dealing with ceramic- and porcelain-making technologies. 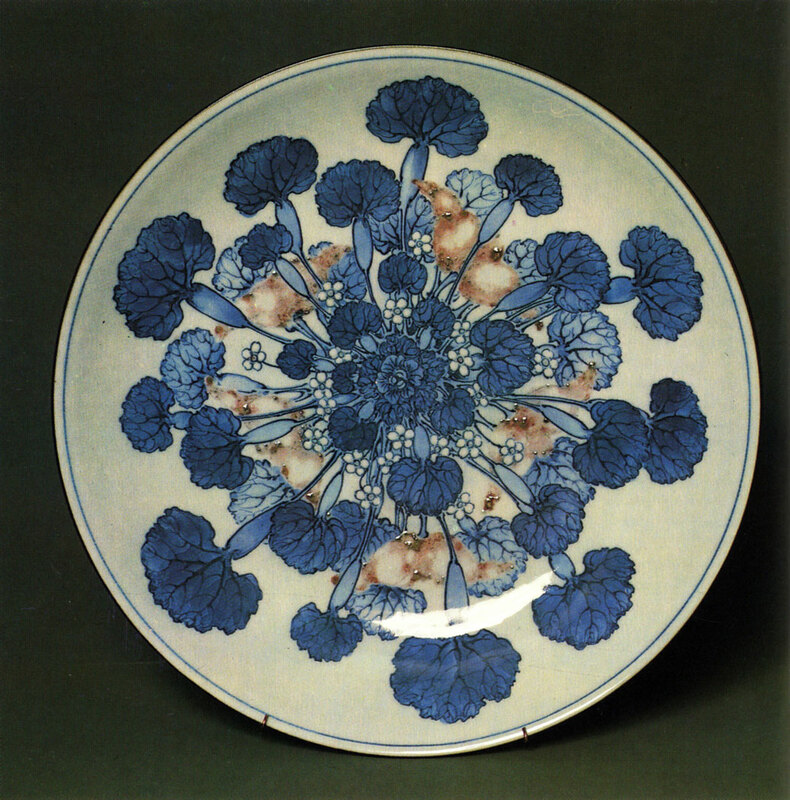 In cooperation with craftsmen of the older generation of porcelain-makers, contemporary masters rediscovered many lost secrets of firing and painting techniques. The famous monochrome glazes-sang-de-bceuf, mirror-black, flambe and the yellow eel glaze came into use again. Contemporary porcelain wares are characterized by a simplicity of form, by a beautiful tonal range of glazes, and a wealth of decorative devices. This dish serves as a fine example of the high artistic merit of the contemporary Chinese porcelain. In contrast with the traditional greyish-green celadons, it is in a smoke-toned blue. The painting is executed in a light sketchy manner. The colour treatment of this dish called for a fairly complicated technological process, in the course of which a new chemical composition of the blue and pink glazes had to be introduced. Indian ink and slight colour on paper. Acquired in 1957 from a private collection. In the 1880s, the general movement whose slogan was the preservation and revival of national culture found response in the activity of Chinese artists who worked in the kuohua (the precious old style) manner. The representatives of this trend endeavoured to preserve the best traditions of national art and at the same time to enrich traditional painting by means of certain devices and artistic principles borrowed from Western European painting. Ch'i Paishih was the most eminent representative of the kuohua style. He was born in the province of Hunan. His real name was Ch'i Huang. The pseudonym he assumed in the course of his artistic career-Paishih-translates as "white stone". A man of many talents, Ch'i Pai-shih was a painter, a calligrapher, a poet and an engraver. For his vast and many-sided artistic activity Ch'i Pai-shih was awarded the international Peace Prize. Having spent the greater part of his creative career in Shanghai, towards the end of his life Ch'i Pai-shih became a professor of the Art Institute in Peking. Ch'i Pai-shih worked in a sketchy and laconic manner known as tahsiehi. This manner was characteristic of the classical wen-jen hua school of painting (intellectuals' painting). "The secret of painting;" the artist used to say, "lies in balancing between verisimilitude and dissimilitude. Excessive verisimilitude means fawning on a philistine. Dissimilitude means deception." In the scroll reproduced here transparent washes of colour are set off with vigorous strokes in deep-black ink. By means of a subtle tonal modelling the artist managed to convey an effect of air and volume, while the contrast of clear details and vague, "diffused" silhouettes enabled him to render the texture of the leaves, flowers, etc. A wistaria-flower in the rays of the spring sun is a poetic symbol of spring and of the beauty of life.